During the day as I sit at my desk, I have a lovely view of my back yard if I look up from my computer. Some days, I’ll become aware of a large shadow passing across the yard. Usually, around the third pass, I’ll become more conscious of the shadow and I’ll realize it must be a red-tailed hawk flying low in search of prey. Sure enough, if I scan the trees, I’ll find it. The red-tailed hawk is quite common and a couple of days ago, through a kitchen window, I saw one glide across my view and land in a tree about 150 feet away. I got my camera and went out to the front steps where I was able to take photos for several minutes before my hands got too cold to handle the camera well any longer. I’m satisfied with the photo above. 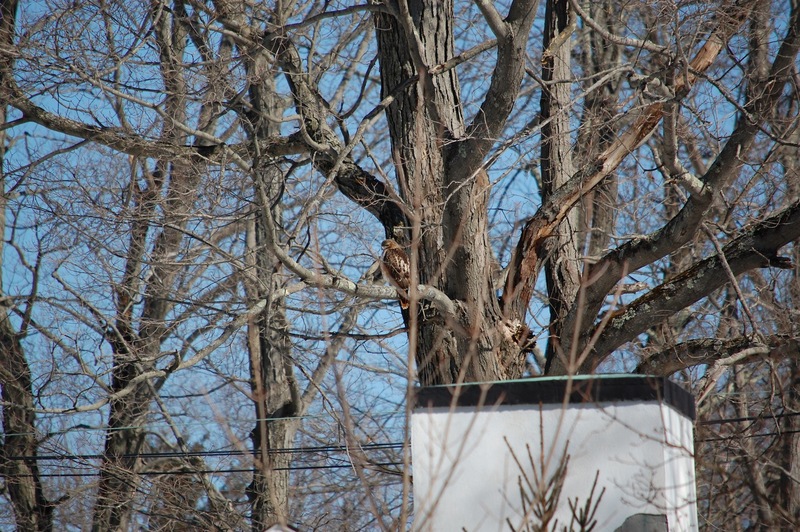 These shots of a hawk in a tree are bound to have obstructed view. Photos I took a few weeks ago of a hawk were completely out of focus as there was just too much branch interference for me to achieve even a good manual focus. I couldn’t see the bird well enough to get the focus. 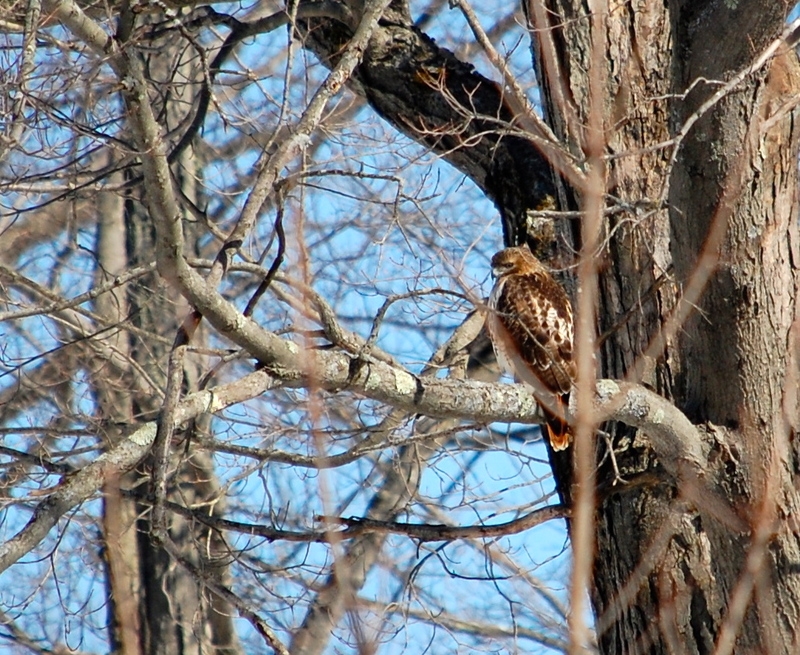 Today, the autofocus did a great job finding the hawk so I didn’t even try manual. And the colors are true which really pleases me. I don’t think I’m exaggerating if I say this hawk was at least 18 inches tall, crown to tail tip. Once I downloaded all the images (about 25 of them) and picked the one in this post as the best, I cropped it. I’m amazed the resolution and focus held so well with such a close crop. A note: Sometimes when I am working a shot like this, I find that I instinctively hyper-focus. That is, quite intensely, I keep both eyes wide open – with one eye looking through the viewfinder and the other looking at the subject directly. Doing so really helps me “find” and “hold” the subject when there is great distance between me and it. And the image focus ends up being better. So that you can appreciate the photo above more, below is the original photo, taken with a 300mm lens. And to help you imagine even further, with the naked eye, I could barely find the bird in the tree it was so far away! Thanks! I was so happy with the results!